For methods of transferring an image onto a 3D surface, see pad printing. For methods of generating autostereoscopic lenticular images, see lenticular printing and holography. The most commonly used 3D Printing process is a material extrusion technique called fused deposition modeling (FDM). Metal Powder bed fusion has been gaining prominence lately during the immense applications of metal parts in the 3D printing industry. In 3D Printing, a three-dimensional object is built from a computer-aided design (CAD) model, usually by successively adding material layer by layer, unlike the conventional machining process, where material is removed from a stock item, or the casting and forging processes which date to antiquity. The umbrella term additive manufacturing (AM) gained popularity in the 2000s, inspired by the theme of material being added together (in any of various ways). In contrast, the term subtractive manufacturing appeared as a retronym for the large family of machining processes with material removal as their common theme. The term 3D printing still referred only to the polymer technologies in most minds, and the term AM was more likely to be used in metalworking and end use part production contexts than among polymer, ink-jet, or stereo lithography enthusiasts. 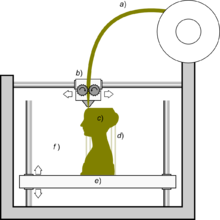 By early 2010s, the terms 3D printing and additive manufacturing evolved senses in which they were alternate umbrella terms for additive technologies, one being used in popular language by consumer-maker communities and the media, and the other used more formally by industrial end-use part producers, machine manufacturers, and global technical standards organizations. Until recently, the term 3D printing has been associated with machines low in price or in capability. 3D printing and additive manufacturing reflect that the technologies share the theme of material addition or joining throughout a 3D work envelope under automated control. Peter Zelinski, the editor-in-chief of Additive Manufacturing magazine, pointed out in 2017 that the terms are still often synonymous in casual usage but some manufacturing industry experts are trying to make a distinction whereby Additive Manufacturing comprises 3D printing plus other technologies or other aspects of a manufacturing process. Other terms that have been used as synonyms or hypernyms have included desktop manufacturing, rapid manufacturing (as the logical production-level successor to rapid prototyping), and on-demand manufacturing (which echoes on-demand printing in the 2D sense of printing). Such application of the adjectives rapid and on-demand to the noun manufacturing was novel in the 2000s reveals the prevailing mental model of the long industrial era in which almost all production manufacturing involved long lead times for laborious tooling development. Today, the term subtractive has not replaced the term machining, instead complementing it when a term that covers any removal method is needed. Agile tooling is the use of modular means to design tooling that is produced by additive manufacturing or 3D printing methods to enable quick prototyping and responses to tooling and fixture needs. Agile tooling uses a cost effective and high quality method to quickly respond to customer and market needs, and it can be used in hydro-forming, stamping, injection molding and other manufacturing processes. 1988: The technology used by most 3D printers to date—especially hobbyist and consumer-oriented models—is fused deposition modeling, a special application of plastic extrusion, developed in 1988 by S. Scott Crump and commercialized by his company Stratasys, which marketed its first FDM machine in 1992. AM processes for metal sintering or melting (such as selective laser sintering, direct metal laser sintering, and selective laser melting) usually went by their own individual names in the 1980s and 1990s. 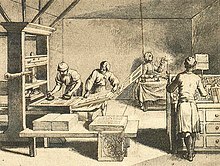 At the time, all metalworking was done by processes that we now call non-additive (casting, fabrication, stamping, and machining); although plenty of automation was applied to those technologies (such as by robot welding and CNC), the idea of a tool or head moving through a 3D work envelope transforming a mass of raw material into a desired shape with a toolpath was associated in metalworking only with processes that removed metal (rather than adding it), such as CNC milling, CNC EDM, and many others. 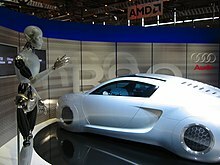 But the automated techniques that added metal, which would later be called additive manufacturing, were beginning to challenge that assumption. By the mid-1990s, new techniques for material deposition were developed at Stanford and Carnegie Mellon University, including microcasting and sprayed materials. Sacrificial and support materials had also become more common, enabling new object geometries. As the various additive processes matured, it became clear that soon metal removal would no longer be the only metalworking process done through a tool or head moving through a 3D work envelope transforming a mass of raw material into a desired shape layer by layer. The 2010s were the first decade in which metal end use parts such as engine brackets and large nuts would be grown (either before or instead of machining) in job production rather than obligately being machined from bar stock or plate. It is still the case that casting, fabrication, stamping, and machining are more prevalent than additive manufacturing in metalworking, but AM is now beginning to make significant inroads, and with the advantages of design for additive manufacturing, it is clear to engineers that much more is to come. 2012: Filabot develops a system for closing the loop with plastic and allows for any FDM or FFF 3D printer to be able to print with a wider range of plastics. 2014: Georgia Institute of Technology Dr. Benjamin S. Cook, and Dr. Manos M. Tentzeris demonstrate the first multi-material, vertically integrated printed electronics additive manufacturing platform (VIPRE) which enabled 3D printing of functional electronics operating up to 40GHz. 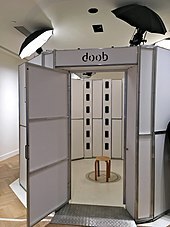 3D models can be generated from 2D pictures taken at a 3D photo booth. CAD models can be saved in the stereolithography file format (STL), a de facto CAD file format for additive manufacturing that stores data based on triangulations of the surface of CAD models. STL is not tailored for additive manufacturing because it generates large file sizes of topology optimized parts and lattice structures due to the large number of surfaces involved. A newer CAD file format, the Additive Manufacturing File format (AMF) was introduced in 2011 to solve this problem. It stores information using curved triangulations. A step in the STL generation known as "repair" fixes such problems in the original model. Generally STLs that have been produced from a model obtained through 3D scanning often have more of these errors. This is due to how 3D scanning works-as it is often by point to point acquisition, 3D reconstruction will include errors in most cases. Though the printer-produced resolution is sufficient for many applications, greater accuracy can be achieved by printing a slightly oversized version of the desired object in standard resolution and then removing material using a higher-resolution subtractive process. The layered structure of all Additive Manufacturing processes leads inevitably to a strain-stepping effect on part surfaces which are curved or tilted in respect to the building platform. The effects strongly depend on the orientation of a part surface inside the building process. Multi-material printing allows objects to be composed of complex and heterogeneous arrangements of materials. It requires a material being directly specified for each voxel inside the object volume. The process is fraught with difficulties, due to the isolated and monolithic algorithms. There are many different ways to solve these problems, such as building a Spec2Fab translator. Or use microstructures to Control Elasticity in 3D Printing. There is also a solution about how to print a Multi-material 3d painting :Deep Multispectral Painting Reproduction via Multi-Layer, Custom-Ink Printing. Multi-material 3D printing is a fundamental element for development of future technology. It has been already applied to variable industries. Other than common applications in small manufacturing industries, to produce toys, shoes, furniture, phone cases, instruments or even artworks. With the BAAM (Big Area Additive Manufacturing) machine, large products such as 3D printed houses or cars are quite feasible. It has also been widely used in high-tech industries. Researchers are devoting to producing high-temperature tools with BAAM for aerospace applications. In medical industry, a concept of 3D printed pills and vaccines has been recently brought up. With this new concept, multiple medications are capable of being united together, which accordingly will decrease many risks. With more and more applications of multi-material 3D printing, the costs of daily life and high technology development will become irreversibly lower. Metallographic materials of 3D printing is also being researched. By classifying each material, CIMP-3D can systematically perform 3D printing with multi materials. ISO/ASTM52900-15 defines seven categories of Additive Manufacturing (AM) processes within its meaning: binder jetting, directed energy deposition, material extrusion, material jetting, powder bed fusion, sheet lamination, and vat photopolymerization. Some methods melt or soften the material to produce the layers. In Fused filament fabrication, also known as Fused deposition modeling (FDM), the model or part is produced by extruding small beads or streams of material which harden immediately to form layers. A filament of thermoplastic, metal wire, or other material is fed into an extrusion nozzle head (3D printer extruder), which heats the material and turns the flow on and off. FDM is somewhat restricted in the variation of shapes that may be fabricated. Another technique fuses parts of the layer and then moves upward in the working area, adding another layer of granules and repeating the process until the piece has built up. This process uses the unfused media to support overhangs and thin walls in the part being produced, which reduces the need for temporary auxiliary supports for the piece. Recently, FFF/FDM has expanded to 3-D print directly from pellets to avoid the conversion to filament. This process is called fused particle fabrication (FPF) (or fused granular fabrication (FGF) and has the potential to use more recycled materials. Powder Bed Fusion techniques, or PBF, include several processes such as DMLS, SLS, SLM, MJF and EBM. Powder Bed Fusion processes can be used with an array of materials and their flexibility allows for geometrically complex structures , making it a go to choice for many 3D printing projects. These techniques include selective laser sintering, with both metals and polymers, and direct metal laser sintering. Selective laser melting does not use sintering for the fusion of powder granules but will completely melt the powder using a high-energy laser to create fully dense materials in a layer-wise method that has mechanical properties similar to those of conventional manufactured metals. Electron beam melting is a similar type of additive manufacturing technology for metal parts (e.g. titanium alloys). EBM manufactures parts by melting metal powder layer by layer with an electron beam in a high vacuum. Another method consists of an inkjet 3D printing system, which creates the model one layer at a time by spreading a layer of powder (plaster, or resins) and printing a binder in the cross-section of the part using an inkjet-like process. With laminated object manufacturing, thin layers are cut to shape and joined together. In addition to the previously mentioned methods, HP has developed the Multi Jet Fusion (MJF) which is a powder base technic, though no laser are involved. An inkjet array applies fusing and detailing agents which are then combined by heating to create a solid layer. Other methods cure liquid materials using different sophisticated technologies, such as stereolithography. Photopolymerization is primarily used in stereolithography to produce a solid part from a liquid. Inkjet printer systems like the Objet PolyJet system spray photopolymer materials onto a build tray in ultra-thin layers (between 16 and 30 µm) until the part is completed. Each photopolymer layer is cured with UV light after it is jetted, producing fully cured models that can be handled and used immediately, without post-curing. Ultra-small features can be made with the 3D micro-fabrication technique used in multiphoton photopolymerisation. 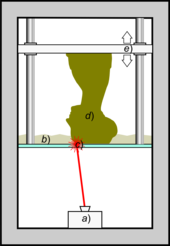 Due to the nonlinear nature of photo excitation, the gel is cured to a solid only in the places where the laser was focused while the remaining gel is then washed away. Feature sizes of under 100 nm are easily produced, as well as complex structures with moving and interlocked parts. Yet another approach uses a synthetic resin that is solidified using LEDs. In Mask-image-projection-based stereolithography, a 3D digital model is sliced by a set of horizontal planes. Each slice is converted into a two-dimensional mask image. The mask image is then projected onto a photocurable liquid resin surface and light is projected onto the resin to cure it in the shape of the layer. Continuous liquid interface production begins with a pool of liquid photopolymer resin. Part of the pool bottom is transparent to ultraviolet light (the "window"), which causes the resin to solidify. The object rises slowly enough to allow resin to flow under and maintain contact with the bottom of the object. In powder-fed directed-energy deposition, a high-power laser is used to melt metal powder supplied to the focus of the laser beam. The powder fed directed energy process is similar to Selective Laser Sintering, but the metal powder is applied only where material is being added to the part at that moment. As of December 2017, additive manufacturing systems were on the market that ranged from $99 to $500,000 in price and were employed in industries including aerospace, architecture, automotive, defense, and medical replacements, among many others. For example, General Electric uses the high-end model to build parts for turbines. Many of these systems are used for rapid prototyping, before mass production methods are employed. Higher education has proven to be a major buyer of desktop and professional 3D printers which industry experts generally view as a positive indicator. 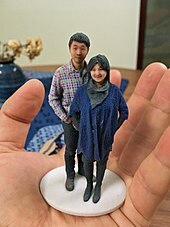 Libraries around the world have also become locations to house smaller 3D printers for educational and community access. Several projects and companies are making efforts to develop affordable 3D printers for home desktop use. Much of this work has been driven by and targeted at DIY/Maker/enthusiast/early adopter communities, with additional ties to the academic and hacker communities. Computed axial lithography is a method for 3D printing based on computerised tomography scans to create prints in photo-curable resin. It was developed by a collaboration between the University of California, Berkeley with Lawrence Livermore National Laboratory. Unlike other methods of 3D printing it does not build models through depositing layers of material like fused deposition modelling and stereolithography, instead it creates objects using a series of 2D images projected onto a cylinder of resin. It is notable for its ability to build an object much more quickly than other methods using resins and the ability to embed objects within the prints. Liquid additive manufacturing (LAM) is an additive manufacturing technique which deposits a liquid or high viscose material (e.g Liquid Silicone Rubber) onto a build surface to create an object which then vulcanised using heat to harden the object. The process was originally created by Adrian Bowyer and was then built upon by German RepRap. In the current scenario, 3D printing or Additive Manufacturing has been used in manufacturing, medical, industry and sociocultural sectors which facilitate 3D printing or Additive Manufacturing to become successful commercial technology. More recently, 3D printing has also been used in the humanitarian and development sector to produce a range of medical items, prosthetics, spares and repairs. The earliest application of additive manufacturing was on the toolroom end of the manufacturing spectrum. For example, rapid prototyping was one of the earliest additive variants, and its mission was to reduce the lead time and cost of developing prototypes of new parts and devices, which was earlier only done with subtractive toolroom methods such as CNC milling, turning, and precision grinding. In the 2010s, additive manufacturing entered production to a much greater extent. Vanessa Friedman, fashion director and chief fashion critic at The New York Times, says 3D printing will have a significant value for fashion companies down the road, especially if it transforms into a print-it-yourself tool for shoppers. "There's real sense that this is not going to happen anytime soon," she says, "but it will happen, and it will create dramatic change in how we think both about intellectual property and how things are in the supply chain." She adds: "Certainly some of the fabrications that brands can use will be dramatically changed by technology." Surgical uses of 3D printing-centric therapies have a history beginning in the mid-1990s with anatomical modeling for bony reconstructive surgery planning. Patient-matched implants were a natural extension of this work, leading to truly personalized implants that fit one unique individual. Virtual planning of surgery and guidance using 3D printed, personalized instruments have been applied to many areas of surgery including total joint replacement and craniomaxillofacial reconstruction with great success. One example of this is the bioresorbable trachial splint to treat newborns with tracheobronchomalacia  developed at the University of Michigan. The use of additive manufacturing for serialized production of orthopedic implants (metals) is also increasing due to the ability to efficiently create porous surface structures that facilitate osseointegration. The hearing aid and dental industries are expected to be the biggest area of future development using the custom 3D printing technology. In March 2014, surgeons in Swansea used 3D printed parts to rebuild the face of a motorcyclist who had been seriously injured in a road accident. In May 2018, 3D printing has been used for the kidney transplant to save a three-year-old boy. As of 2012[update], 3D bio-printing technology has been studied by biotechnology firms and academia for possible use in tissue engineering applications in which organs and body parts are built using inkjet printing techniques. In this process, layers of living cells are deposited onto a gel medium or sugar matrix and slowly built up to form three-dimensional structures including vascular systems. Recently, a heart-on-chip has been created which matches properties of cells. In 3D printing, computer-simulated microstructures are commonly used to fabricate objects with spatially varying properties. This is achieved by dividing the volume of the desired object into smaller subcells using computer aided simulation tools and then filling these cells with appropriate microstructures during fabrication. Several different candidate structures with similar behaviours are checked against each other and the object is fabricated when an optimal set of structures are found. Advanced topology optimization methods are used to ensure the compatibility of structures in adjacent cells. This flexible approach to 3D fabrication is widely used across various disciplines from biomedical sciences where they are used to create complex bone structures and human tissue to robotics where they are used in the creation of soft robots with movable parts. In 2018, 3D printing technology was used for the first time to create a matrix for cell immobilization in fermentation. Propionic acid production by Propionibacterium acidipropionici immobilized on 3D-printed nylon beads was chosen as a model study. It was shown that those 3D-printed beads were capable of promoting high density cell attachment and propionic acid production, which could be adapted to other fermentation bioprocesses. In 2005, academic journals had begun to report on the possible artistic applications of 3D printing technology. As of 2017, domestic 3D printing was reaching a consumer audience beyond hobbyists and enthusiasts. Off the shelf machines were increasingly capable of producing practical household applications, for example, ornamental objects. Some practical examples include a working clock and gears printed for home woodworking machines among other purposes. Web sites associated with home 3D printing tended to include backscratchers, coat hooks, door knobs, etc. 3D printing, and open source 3D printers in particular, are the latest technology making inroads into the classroom. Some authors have claimed that 3D printers offer an unprecedented "revolution" in STEM education. The evidence for such claims comes from both the low-cost ability for rapid prototyping in the classroom by students, but also the fabrication of low-cost high-quality scientific equipment from open hardware designs forming open-source labs. Future applications for 3D printing might include creating open-source scientific equipment. 3D printed soft actuators is a growing application of 3D printing technology which has found its place in the 3D printing applications. These soft actuators are being developed to deal with soft structures and organs especially in biomedical sectors and where the interaction between human and robot is inevitable. The majority of the existing soft actuators are fabricated by conventional methods that require manual fabrication of devices, post processing/assembly, and lengthy iterations until maturity of the fabrication is achieved. Instead of the tedious and time-consuming aspects of the current fabrication processes, researchers are exploring an appropriate manufacturing approach for effective fabrication of soft actuators. Thus, 3D printed soft actuators are introduced to revolutionise the design and fabrication of soft actuators with custom geometrical, functional, and control properties in a faster and inexpensive approach. They also enable incorporation of all actuator components into a single structure eliminating the need to use external joints, adhesives, and fasteners. 3D printing has existed for decades within certain manufacturing industries where many legal regimes, including patents, industrial design rights, copyrights, and trademarks may apply. However, there is not much jurisprudence to say how these laws will apply if 3D printers become mainstream and individuals or hobbyist communities begin manufacturing items for personal use, for non-profit distribution, or for sale. Patents cover inventions including processes, machines, manufacturing, and compositions of matter and have a finite duration which varies between countries, but generally 20 years from the date of application. Therefore, if a type of wheel is patented, printing, using, or selling such a wheel could be an infringement of the patent. Copyright covers an expression in a tangible, fixed medium and often lasts for the life of the author plus 70 years thereafter. If someone makes a statue, they may have a copyright mark on the appearance of that statue, so if someone sees that statue, they cannot then distribute designs to print an identical or similar statue. The US Department of Homeland Security and the Joint Regional Intelligence Center released a memo stating that "significant advances in three-dimensional (3D) printing capabilities, availability of free digital 3D printable files for firearms components, and difficulty regulating file sharing may present public safety risks from unqualified gun seekers who obtain or manufacture 3D printed guns" and that "proposed legislation to ban 3D printing of weapons may deter, but cannot completely prevent, their production. Even if the practice is prohibited by new legislation, online distribution of these 3D printable files will be as difficult to control as any other illegally traded music, movie or software files." Attempting to restrict the distribution of gun plans via the Internet has been likened to the futility of preventing the widespread distribution of DeCSS, which enabled DVD ripping. After the US government had Defense Distributed take down the plans, they were still widely available via the Pirate Bay and other file sharing sites. Downloads of the plans from the UK, Germany, Spain, and Brazil were heavy. Some US legislators have proposed regulations on 3D printers to prevent them from being used for printing guns. 3D printing advocates have suggested that such regulations would be futile, could cripple the 3D printing industry, and could infringe on free speech rights, with early pioneer of 3D printing Professor Hod Lipson suggesting that gunpowder could be controlled instead. Internationally, where gun controls are generally stricter than in the United States, some commentators have said the impact may be more strongly felt since alternative firearms are not as easily obtainable. Officials in the United Kingdom have noted that producing a 3D printed gun would be illegal under their gun control laws. Europol stated that criminals have access to other sources of weapons but noted that as technology improves, the risks of an effect would increase. In the United States, the FAA has anticipated a desire to use additive manufacturing techniques and has been considering how best to regulate this process. The FAA has jurisdiction over such fabrication because all aircraft parts must be made under FAA production approval or under other FAA regulatory categories. In December 2016, the FAA approved the production of a 3D printed fuel nozzle for the GE LEAP engine. Aviation attorney Jason Dickstein has suggested that additive manufacturing is merely a production method, and should be regulated like any other production method. He has suggested that the FAA's focus should be on guidance to explain compliance, rather than on changing the existing rules, and that existing regulations and guidance permit a company "to develop a robust quality system that adequately reflects regulatory needs for quality assurance." Research on the health and safety concerns of 3D printing is new and in development due to the recent proliferation of 3D printing devices. In 2017 the European Agency for Safety and Health at Work has published a discussion paper on the processes and materials involved in 3D printing, potential implications of this technology for occupational safety and health and avenues for controlling potential hazards. Most concerns involve gas and material exposures, in particular nanomaterials, material handling, static electricity, moving parts and pressures. A National Institute for Occupational Safety and Health (NIOSH) study noted particle emissions from a fused filament peaked a few minutes after printing started and returned to baseline levels 100 minutes after printing ended. Emissions from fused filament printers can include a large number of ultrafine particles and volatile organic compounds (VOCs). The toxicity from emissions varies by source material due to differences in size, chemical properties, and quantity of emitted particles. Excessive exposure to VOCs can lead to irritation of the eyes, nose, and throat, headache, loss of coordination, and nausea and some of the chemical emissions of fused filament printers have also been linked to asthma. Based on animal studies, carbon nanotubes and carbon nanofibers sometimes used in fused filament printing can cause pulmonary effects including inflammation, granulomas, and pulmonary fibrosis when at the nanoparticle size. As of March 2018,[update] the US Government has set 3D printer emission standards for only a limited number of compounds. Furthermore, the few established standards address factory conditions, not home or other environments in which the printers are likely to be used. Carbon nanoparticle emissions and processes using powder metals are highly combustible and raise the risk of dust explosions. At least one case of severe injury was noted from an explosion involved in metal powders used for fused filament printing. Other general health and safety concerns include the hot surface of UV lamps and print head blocks, high voltage, ultraviolet radiation from UV lamps, and potential for mechanical injury from moving parts. The problems noted in the NIOSH report were reduced by using manufacturer-supplied covers and full enclosures, using proper ventilation, keeping workers away from the printer, using respirators, turning off the printer if it jammed, and using lower emission printers and filaments. Personal protective equipment has been found to be the least desirable control method with a recommendation that it only be used to add further protection in combination with approved emissions protection. Hazards to health and safety also exist from post-processing activities done to finish parts after they have been printed. These post-processing activities can include chemical baths, sanding, polishing, or vapor exposure to refine surface finish, as well as general subtractive manufacturing techniques such as drilling, milling, or turning to modify the printed geometry. Any technique that removes material from the printed part has the potential to generate particles that can be inhaled or cause eye injury if proper personal protective equipment is not used, such as respirators or safety glasses. Caustic baths are often used to dissolve support material used by some 3D printers that allows them to print more complex shapes. These baths require personal protective equipment to prevent injury to exposed skin. Since 3-D imaging creates items by fusing materials together, there runs the risk of layer separation in some devices made using 3-D Imaging. For example, in January 2013, the US medical device company, DePuy, recalled their knee and hip replacement systems. The devices were made from layers of metal, and shavings had come loose – potentially harming the patient. Others have suggested that as more and more 3D printers start to enter people's homes, the conventional relationship between the home and the workplace might get further eroded. Likewise, it has also been suggested that, as it becomes easier for businesses to transmit designs for new objects around the globe, so the need for high-speed freight services might also become less. Finally, given the ease with which certain objects can now be replicated, it remains to be seen whether changes will be made to current copyright legislation so as to protect intellectual property rights with the new technology widely available. Some call attention to the conjunction of Commons-based peer production with 3D printing and other low-cost manufacturing techniques. The self-reinforced fantasy of a system of eternal growth can be overcome with the development of economies of scope, and here, society can play an important role contributing to the raising of the whole productive structure to a higher plateau of more sustainable and customized productivity. Further, it is true that many issues, problems, and threats arise due to the democratization of the means of production, and especially regarding the physical ones. For instance, the recyclability of advanced nanomaterials is still questioned; weapons manufacturing could become easier; not to mention the implications for counterfeiting and on intellectual property. It might be maintained that in contrast to the industrial paradigm whose competitive dynamics were about economies of scale, Commons-based peer production 3D printing could develop economies of scope. While the advantages of scale rest on cheap global transportation, the economies of scope share infrastructure costs (intangible and tangible productive resources), taking advantage of the capabilities of the fabrication tools. And following Neil Gershenfeld in that "some of the least developed parts of the world need some of the most advanced technologies," Commons-based peer production and 3D printing may offer the necessary tools for thinking globally but acting locally in response to certain needs. Larry Summers wrote about the "devastating consequences" of 3D printing and other technologies (robots, artificial intelligence, etc.) for those who perform routine tasks. In his view, "already there are more American men on disability insurance than doing production work in manufacturing. And the trends are all in the wrong direction, particularly for the less skilled, as the capacity of capital embodying artificial intelligence to replace white-collar as well as blue-collar work will increase rapidly in the years ahead." Summers recommends more vigorous cooperative efforts to address the "myriad devices" (e.g., tax havens, bank secrecy, money laundering, and regulatory arbitrage) enabling the holders of great wealth to "a paying" income and estate taxes, and to make it more difficult to accumulate great fortunes without requiring "great social contributions" in return, including: more vigorous enforcement of anti-monopoly laws, reductions in "excessive" protection for intellectual property, greater encouragement of profit-sharing schemes that may benefit workers and give them a stake in wealth accumulation, strengthening of collective bargaining arrangements, improvements in corporate governance, strengthening of financial regulation to eliminate subsidies to financial activity, easing of land-use restrictions that may cause the real estate of the rich to keep rising in value, better training for young people and retraining for displaced workers, and increased public and private investment in infrastructure development—e.g., in energy production and transportation. Michael Spence wrote that "Now comes a ... powerful, wave of digital technology that is replacing labor in increasingly complex tasks. This process of labor substitution and disintermediation has been underway for some time in service sectors—think of ATMs, online banking, enterprise resource planning, customer relationship management, mobile payment systems, and much more. This revolution is spreading to the production of goods, where robots and 3D printing are displacing labor." In his view, the vast majority of the cost of digital technologies comes at the start, in the design of hardware (e.g. 3D printers) and, more important, in creating the software that enables machines to carry out various tasks. "Once this is achieved, the marginal cost of the hardware is relatively low (and declines as scale rises), and the marginal cost of replicating the software is essentially zero. With a huge potential global market to amortize the upfront fixed costs of design and testing, the incentives to invest [in digital technologies] are compelling." Spence believes that, unlike prior digital technologies, which drove firms to deploy underutilized pools of valuable labor around the world, the motivating force in the current wave of digital technologies "is cost reduction via the replacement of labor." For example, as the cost of 3D printing technology declines, it is "easy to imagine" that production may become "extremely" local and customized. Moreover, production may occur in response to actual demand, not anticipated or forecast demand. Spence believes that labor, no matter how inexpensive, will become a less important asset for growth and employment expansion, with labor-intensive, process-oriented manufacturing becoming less effective, and that re-localization will appear in both developed and developing countries. In his view, production will not disappear, but it will be less labor-intensive, and all countries will eventually need to rebuild their growth models around digital technologies and the human capital supporting their deployment and expansion. Spence writes that "the world we are entering is one in which the most powerful global flows will be ideas and digital capital, not goods, services, and traditional capital. Adapting to this will require shifts in mindsets, policies, investments (especially in human capital), and quite possibly models of employment and distribution." Naomi Wu regards the usage of 3D printing in the Chinese classroom (where rote memorization is standard) to teach design principles and creativity as the most exciting recent development of the technology, and more generally regards 3D printing as being the next desktop publishing revolution. The growth of additive manufacturing could have a large impact on the environment. As opposed to traditional manufacturing, for instance, in which pieces are cut from larger blocks of material, additive manufacturing creates products layer-by-layer and prints only relevant parts, wasting much less material and thus wasting less energy in producing the raw materials needed. By making only the bare structural necessities of products, additive manufacturing also could make a profound contribution to lightweighting, reducing the energy consumption and greenhouse gas emissions of vehicles and other forms of transportation. A case study on an airplane component made using additive manufacturing, for example, found that the component's use saves 63% of relevant energy and carbon dioxide emissions over the course of the product's lifetime. In addition, previous life-cycle assessment of additive manufacturing has estimated that adopting the technology could further lower carbon dioxide emissions since 3D printing creates localized production, and products would not need to be transported long distances to reach their final destination. Continuing to adopt additive manufacturing does pose some environmental downsides, however. Despite additive manufacturing reducing waste from the subtractive manufacturing process by up to 90%, the additive manufacturing process creates other forms of waste such as non-recyclable material powders. Additive manufacturing has not yet reached its theoretical material efficiency potential of 97%, but it may get closer as the technology continues to increase productivity. ^ Excell, Jon. "The rise of additive manufacturing". The Engineer. Retrieved 30 October 2013. ^ "Additive manufacturing — General Principles — Overview of process categories and feedstock". ISO/ASTM International Standard (17296–2:2015(E)). 2015. ^ "Most used 3D printing technologies 2017–2018 | Statistic". Statista. Retrieved 2 December 2018. ^ Taufik, Mohammad; Jain, Prashant K. (12 January 2014). "Role of build orientation in layered manufacturing: a review". International Journal of Manufacturing Technology and Management. 27 (1/2/3): 47–73. doi:10.1504/IJMTM.2013.058637. ^ Bin Hamzah, Hairul Hisham; Keattch, Oliver; Covill, Derek; Patel, Bhavik Anil (2018). "The effects of printing orientation on the electrochemical behaviour of 3D printed acrylonitrile butadiene styrene (ABS)/carbon black electrodes". Scientific Reports. 8 (1): 9135. Bibcode:2018NatSR...8.9135B. doi:10.1038/s41598-018-27188-5. PMC 6002470. PMID 29904165. ^ "Google Ngram of the term additive manufacturing". ^ "ISO/ASTM 52900:2015 – Additive manufacturing – General principles – Terminology". www.iso.org. Retrieved 15 June 2017. ^ a b Zelinski, Peter (4 August 2017), "Additive manufacturing and 3D printing are two different things", Additive Manufacturing, retrieved 11 August 2017. ^ a b Jane Bird (8 August 2012). "Exploring the 3D printing opportunity". Financial Times. Retrieved 30 August 2012. ^ Jean-Claude, Andre. "Disdpositif pour realiser un modele de piece industrielle". National De La Propriete Industrielle. ^ Mendoza, Hannah Rose (15 May 2015). "Alain Le Méhauté, The Man Who Submitted Patent For SLA 3D Printing Before Chuck Hull". 3dprint.com. ^ Moussion, Alexandre (2014). "Interview d'Alain Le Méhauté, l'un des pères de l'impression (Interview of Alain Le Mehaute, one of the 3D printinf technologies fathers) 3D". Primante 3D. ^ "3D Printing: What You Need to Know". PCMag.com. Retrieved 30 October 2013. ^ Freedman, David H (2012). "Layer By Layer". Technology Review. 115 (1): 50–53. ^ Amon, C. H.; Beuth, J. L.; Weiss, L. E.; Merz, R.; Prinz, F. B. (1998). "Shape Deposition Manufacturing With Microcasting: Processing, Thermal and Mechanical Issues" (PDF). Journal of Manufacturing Science and Engineering. 120 (3). Retrieved 20 December 2014. ^ Beck, J.E. ; Fritz, B.; Siewiorek, Daniel; Weiss, Lee (1992). "Manufacturing Mechatronics Using Thermal Spray Shape Deposition" (PDF). Proceedings of the 1992 Solid Freeform Fabrication Symposium. Archived from the original (PDF) on 24 December 2014. Retrieved 20 December 2014. ^ Prinz, F. B.; Merz, R.; Weiss, Lee (1997). Ikawa, N. (ed.). Building Parts You Could Not Build Before. Proceedings of the 8th International Conference on Production Engineering. 2–6 Boundary Row, London SE1 8HN, UK: Chapman & Hall. pp. 40–44. ^ "How expiring patents are ushering in the next generation of 3D printing". ^ Pearce, Joshua M.; Morris Blair, Christine; Laciak, Kristen J.; Andrews, Rob; Nosrat, Amir; Zelenika-Zovko, Ivana (2010). "3-D Printing of Open Source Appropriate Technologies for Self-Directed Sustainable Development". Journal of Sustainable Development. 3 (4). doi:10.5539/jsd.v3n4p17. ^ b. Mtaho, Adam; r.Ishengoma, Fredrick (2014). "3D Printing: Developing Countries Perspectives". International Journal of Computer Applications. 104 (11): 30. arXiv:1410.5349. Bibcode:2014IJCA..104k..30R. doi:10.5120/18249-9329. ^ "Filabot: Plastic Filament Maker". Kickstarter. Retrieved 1 December 2018. ^ "3D Incorporated about page". 3D Incorporated. Retrieved 31 July 2018. ^ "Gigabot Proves Even 3D Printing is Bigger in Texas". Make Magazine. 10 April 2015. Retrieved 31 July 2018. ^ "VIPRE 3D Printed Electronics". Retrieved 2 April 2019. ^ Jackson, Beau (12 March 2018). "re:3D launches Kickstarter for Gigabot X its greenest 3D printer yet". 3D Pprinting Industry]. Retrieved 31 July 2018. ^ Jacobs, Paul Francis (1 January 1992). Rapid Prototyping & Manufacturing: Fundamentals of Stereolithography. Society of Manufacturing Engineers. ISBN 978-0-87263-425-1. ^ Azman, Abdul Hadi; Vignat, Frédéric; Villeneuve, François (29 April 2018). "CAD TOOLS AND FILE FORMAT PERFORMANCE EVALUATION IN DESIGNING LATTICE STRUCTURES FOR ADDITIVE MANUFACTURING". Jurnal Teknologi. 80 (4). ISSN 2180-3722. ^ "3D solid repair software – Fix STL polygon mesh files – LimitState:FIX". Print.limitstate.com. Retrieved 4 January 2016. ^ "3D Printing Pens". yellowgurl.com. Retrieved 9 August 2016. ^ "Model Repair Service". Modelrepair.azurewebsites.net. Retrieved 4 January 2016. ^ "Magics, the Most Powerful 3D Printing Software | Software for additive manufacturing". Software.materialise.com. Retrieved 4 January 2016. ^ "netfabb Cloud Services". Netfabb.com. 15 May 2009. Retrieved 4 January 2016. ^ "How to repair a 3D scan for printing". Anamarva.com. Retrieved 4 January 2016. ^ Fausto Bernardini, Holly E. Rushmeier (2002). "The 3D Model Acquisition Pipeline GAS" (PDF). Comput. Graph. Forum. 21 (2): 149–72. doi:10.1111/1467-8659.00574. ^ "Objet Connex 3D Printers". Objet Printer Solutions. Retrieved 31 January 2012. ^ "Design Guide: Preparing a File for 3D Printing" (PDF). Xometry. ^ "Advantages of 3D printing over traditional manufacturing". 3DPrinterPrices.net. 10 July 2013. Retrieved 16 February 2017. ^ "How to 3D-print super-fast and have an awesome finishing". 3dprinterchat. Retrieved 5 May 2016. ^ "How to Smooth 3D-Printed Parts". ^ Delfs, P.; T̈ows, M.; Schmid, H.-J. (October 2016). "Optimized build orientation of additive manufactured parts for improved surface quality and build time". Additive Manufacturing. 12: 314–320. doi:10.1016/j.addma.2016.06.003. ISSN 2214-8604. ^ Kraft, Caleb. "Smoothing Out Your 3D Prints With Acetone Vapor". Make. Make. Retrieved 5 January 2016. ^ Haselhuhn, Amberlee S.; Gooding, Eli J.; Glover, Alexandra G.; Anzalone, Gerald C.; Wijnen, Bas; Sanders, Paul G.; Pearce, Joshua M. (2014). "Substrate Release Mechanisms for Gas Metal Arc Weld 3D Aluminum Metal Printing". 3D Printing and Additive Manufacturing. 1 (4): 204. doi:10.1089/3dp.2014.0015. ^ Haselhuhn, Amberlee S.; Wijnen, Bas; Anzalone, Gerald C.; Sanders, Paul G.; Pearce, Joshua M. (2015). "In situ formation of substrate release mechanisms for gas metal arc weld metal 3-D printing". Journal of Materials Processing Technology. 226: 50. doi:10.1016/j.jmatprotec.2015.06.038. ^ Spec2Fab: A reducer-tuner model for translating specifications to 3D prints. Spec2Fab. CiteSeerX 10.1.1.396.2985. ^ microstructures to Control Elasticity in 3D Printing (pdf). Microstructures to Control Elasticity in 3D Printing. ^ Deep Multispectral Painting Reproduction via Multi-Layer, Custom-Ink Printing (pdf). Deep Multispectral Painting Reproduction via Multi-Layer, Custom-Ink Printing. ^ multi-material 3d printer (html). multi-material 3d printer. ^ multi material printing. multi material printing (in Chinese). ^ Manufacturing Demonstration Facility’s New BAAM 3D Printer Gets a Multi-Material Upgrade. Manufacturing Demonstration Facility’s New BAAM 3D Printer Gets a Multi-Material Upgrade. ^ Researchers Turn to Multi-Material 3D Printing to Develop Responsive, Versatile Smart Composites. Researchers Turn to Multi-Material 3D Printing to Develop Responsive, Versatile Smart Composites. ^ CIMP-3D (html). CIMP-3d (in Chinese). ^ Sherman, Lilli Manolis (15 November 2007). "A whole new dimension – Rich homes can afford 3D printers". The Economist. ^ Wohlers, Terry. "Factors to Consider When Choosing a 3D Printer (WohlersAssociates.com, Nov/Dec 2005)". ^ www.3ders.org (25 September 2012). "Casting aluminum parts directly from 3D printed PLA parts". 3ders.org. Retrieved 30 October 2013. ^ "How Selective Heat Sintering Works". THRE3D.com. Archived from the original on 3 February 2014. Retrieved 3 February 2014. ^ Woern, Aubrey; Byard, Dennis; Oakley, Robert; Fiedler, Matthew; Snabes, Samantha (12 August 2018). "Fused Particle Fabrication 3-D Printing: Recycled Materials' Optimization and Mechanical Properties". Materials. 11 (8): 1413. Bibcode:2018Mate...11.1413W. doi:10.3390/ma11081413. PMC 6120030. PMID 30103532. ^ "Powder Bed Fusion processes". ^ "Aluminum-powder DMLS-printed part finishes race first". ^ Hiemenz, Joe. "Rapid prototypes move to metal components (EE Times, 3/9/2007)". ^ "Rapid Manufacturing by Electron Beam Melting". SMU.edu. ^ "Multi Jet Fusion (MJF) by HP". ^ Johnson, R. Colin. "Cheaper avenue to 65 nm? (EE Times, 3/30/2007)". ^ "The World's Smallest 3D Printer". TU Wien. 12 September 2011. ^ "3D-printing multi-material objects in minutes instead of hours". Kurzweil Accelerating Intelligence. 22 November 2013. ^ St. Fleur, Nicholas (17 March 2015). "3-D Printing Just Got 100 Times Faster". The Atlantic. Retrieved 19 March 2015. ^ Beese, Allison M.; Carroll, Beth E. (2015). "Review of Mechanical Properties of Ti-6Al-4V Made by Laser-Based Additive Manufacturing Using Powder Feedstock". JOM. 68 (3): 724. Bibcode:2016JOM....68c.724B. doi:10.1007/s11837-015-1759-z. ^ Gibson, Ian; Rosen, David; Stucker, Brent (2015). Additive Manufacturing Technologies. doi:10.1007/978-1-4939-2113-3. ISBN 978-1-4939-2112-6. ^ "3D Printing: Challenges and Opportunities for International Relations". Council on Foreign Relations. 23 October 2013. Archived from the original on 28 October 2013. Retrieved 30 October 2013. ^ "Despite Market Woes, 3D Printing Has a Future Thanks to Higher Education – Bold". 2 December 2015. ^ "UMass Amherst Library Opens 3-D Printing Innovation Center". ^ Kalish, Jon. "A Space For DIY People To Do Their Business (NPR.org, November 28, 2010)". Retrieved 31 January 2012. ^ a b Kelly, Brett E.; Bhattacharya, Indrasen; Heidari, Hossein; Shusteff, Maxim; Spadaccini, Christopher M.; Taylor, Hayden K. (31 January 2019). "Volumetric additive manufacturing via tomographic reconstruction". Science: eaau7114. doi:10.1126/science.aau7114. ISSN 0036-8075. PMID 30705152. ^ a b "Star Trek–like replicator creates entire objects in minutes". Science. Retrieved 31 January 2019. ^ a b Kelly, Brett; Bhattacharya, Indrasen; Shusteff, Maxim; Panas, Robert M.; Taylor, Hayden K.; Spadaccini, Christopher M. (16 May 2017). "Computed Axial Lithography (CAL): Toward Single Step 3D Printing of Arbitrary Geometries". arXiv:1705.05893 [cs.GR]. ^ a b "German RepRap introduces L280, first Liquid Additive Manufacturing (LAM) production-ready 3D printer". 3ders.org. Retrieved 13 April 2019. ^ Davies, Sam (2 November 2018). "German RepRap to present series-ready Liquid Additive Manufacturing system at Formnext". TCT Magazine. Retrieved 13 April 2019. ^ "German RepRap presenting Liquid Additive Manufacturing technology at RAPID+TCT". TCT Magazine. 10 May 2017. Retrieved 13 April 2019. ^ Scott, Clare (2 November 2018). "German RepRap to Present Liquid Additive Manufacturing and L280 3D Printer at Formnext". 3DPrint.com | The Voice of 3D Printing / Additive Manufacturing. Retrieved 13 April 2019. ^ "German RepRap develops new polyurethane material for Liquid Additive Manufacturing". TCT Magazine. 2 August 2017. Retrieved 13 April 2019. ^ Taufik, Mohammad; Jain, Prashant K. (10 December 2016). "Additive Manufacturing: Current Scenario". Proceedings of International Conference On: Advanced Production and Industrial Engineering -ICAPIE 2016: 380–386. ^ Wong, Venessa. "A Guide to All the Food That's Fit to 3D Print (So Far)". Bloomberg.com. ^ "Did BeeHex Just Hit 'Print' to Make Pizza at Home?". Retrieved 28 May 2016. ^ "Foodini 3D Printer Cooks Up Meals Like the Star Trek Food Replicator". Retrieved 27 January 2015. ^ a b "3D Printed Clothing Becoming a Reality". Resins Online. 17 June 2013. Retrieved 30 October 2013. ^ Michael Fitzgerald (28 May 2013). "With 3-D Printing, the Shoe Really Fits". MIT Sloan Management Review. Retrieved 30 October 2013. ^ Sharma, Rakesh (10 September 2013). "3D Custom Eyewear The Next Focal Point For 3D Printing". Forbes.com. Retrieved 10 September 2013. ^ Alvarez, Edgar. "Fashion and technology will inevitably become one". Engagdet. ^ "Koenigsegg One:1 Comes With 3D Printed Parts". Business Insider. Retrieved 14 May 2014. ^ Eternity, Max. "The Urbee 3D-Printed Car: Coast to Coast on 10 Gallons?". ^ "Local Motors shows Strati, the world's first 3D-printed car". 13 January 2015. ^ Simmons, Dan (6 May 2015). "Airbus had 1,000 parts 3D printed to meet deadline". BBC. Retrieved 27 November 2015. ^ Zitun, Yoav (27 July 2015). "The 3D printer revolution comes to the IAF". Ynet News. Retrieved 29 September 2015. ^ Zelinski, Peter (31 March 2017), "GE team secretly printed a helicopter engine, replacing 900 parts with 16", Modern Machine Shop, retrieved 9 April 2017. ^ Greenberg, Andy (23 August 2012). "'Wiki Weapon Project' Aims To Create A Gun Anyone Can 3D-Print At Home". Forbes. Retrieved 27 August 2012. ^ Poeter, Damon (24 August 2012). "Could a 'Printable Gun' Change the World?". PC Magazine. Retrieved 27 August 2012. ^ Samsel, Aaron. "3D Printers, Meet Othermill: A CNC machine for your home office (VIDEO)". Guns.com. Retrieved 30 October 2013. ^ "The Third Wave, CNC, Stereolithography, and the end of gun control". Popehat. Retrieved 30 October 2013. ^ Rosenwald, Michael S. (25 February 2013). "Weapons made with 3-D printers could test gun-control efforts". Washington Post. ^ "Making guns at home: Ready, print, fire". The Economist. 16 February 2013. Retrieved 30 October 2013. ^ Rayner, Alex (6 May 2013). "3D-printable guns are just the start, says Cody Wilson". The Guardian. London. ^ Manjoo, Farhad (8 May 2013). "3-D-printed gun: Yes, it will be possible to make weapons with 3-D printers. No, that doesn't make gun control futile". Slate.com. Retrieved 30 October 2013. ^ Eppley, B. L.; Sadove, A. M. (1 November 1998). "Computer-generated patient models for reconstruction of cranial and facial deformities". J Craniofac Surg. 9 (6): 548–556. doi:10.1097/00001665-199811000-00011. PMID 10029769. ^ Poukens, Jules (1 February 2008). "A classification of cranial implants based on the degree of difficulty in computer design and manufacture". The International Journal of Medical Robotics and Computer Assisted Surgery. 4 (1): 46–50. doi:10.1002/rcs.171. PMID 18240335. ^ Zopf, David A.; Hollister, Scott J.; Nelson, Marc E.; Ohye, Richard G.; Green, Glenn E. (2013). "Bioresorbable Airway Splint Created with a Three-Dimensional Printer". New England Journal of Medicine. 368 (21): 2043–5. doi:10.1056/NEJMc1206319. PMID 23697530. ^ Moore, Calen (11 February 2014). "Surgeons have implanted a 3-D-printed pelvis into a U.K. cancer patient". fiercemedicaldevices.com. Retrieved 4 March 2014. ^ Perry, Keith (12 March 2014). "Man makes surgical history after having his shattered face rebuilt using 3D printed parts". London: The Daily Telegraph. Retrieved 12 March 2014. ^ "Boy gets kidney transplant thanks to 3D printing". Sky News. Retrieved 11 June 2018. ^ "3D-printed sugar network to help grow artificial liver". BBC News. ^ "Harvard engineers create the first fully 3D printed heart-on-a-chip". ^ "TU Delft Researchers Discuss Microstructural Optimization for 3D Printing Trabecular Bone". ^ "How Doctors Can Use 3D Printing to Help Their Patients Recover Faster". PharmaNext. ^ Cho, Kyu-Jin; Koh, Je-Sung; Kim, Sangwoo; Chu, Won-Shik; Hong, Yongtaek; Ahn, Sung-Hoon (2009). "Review of manufacturing processes for soft biomimetic robots". International Journal of Precision Engineering and Manufacturing. 10 (3): 171–181. doi:10.1007/s12541-009-0064-6. ^ Rus, Daniela; Tolley, Michael T. (2015). "Design, fabrication and control of soft robots". Nature. 521 (7553): 467. Bibcode:2015Natur.521..467R. doi:10.1038/nature14543. PMID 26017446. ^ Séquin, Carlo H. (2005). "Rapid prototyping". Communications of the ACM. 48 (6): 66–73. Bibcode:1985CACM...28...22S. doi:10.1145/1064830.1064860. INIST:16817711. ^ ewilhelm. "3D printed clock and gears". Instructables.com. Retrieved 30 October 2013. ^ 23 January 2012 (23 January 2012). "Successful Sumpod 3D printing of a herringbone gear". 3d-printer-kit.com. Archived from the original on 2 November 2013. Retrieved 30 October 2013. ^ ""backscratcher" 3D Models to Print – yeggi". ^ Schelly, C., Anzalone, G., Wijnen, B., & Pearce, J. M. (2015). "Open-source 3-D printing Technologies for education: Bringing Additive Manufacturing to the Classroom." Journal of Visual Languages & Computing. ^ Grujović, N., Radović, M., Kanjevac, V., Borota, J., Grujović, G., & Divac, D. (September 2011). "3D printing technology in education environment." In 34th International Conference on Production Engineering (pp. 29–30). ^ Mercuri, Rebecca; Meredith, Kevin (2014). "An educational venture into 3D Printing". 2014 IEEE Integrated STEM Education Conference. pp. 1–6. doi:10.1109/ISECon.2014.6891037. ISBN 978-1-4799-3229-0. ^ Pantazis, A.; Priavolou, C. (2017). "3D printing as a means of learning and communication: The 3Ducation project revisited". Telematics and Informatics. 34: 1465−1476. doi:10.1016/j.tele.2017.06.010. ^ a b Zhang, Chenlong; Anzalone, Nicholas C.; Faria, Rodrigo P.; Pearce, Joshua M. (2013). "Open-Source 3D-Printable Optics Equipment". PLoS ONE. 8 (3): e59840. Bibcode:2013PLoSO...859840Z. doi:10.1371/journal.pone.0059840. PMC 3609802. PMID 23544104. ^ Scopigno, R.; Cignoni, P.; Pietroni, N.; Callieri, M.; Dellepiane, M. (2017). "Digital Fabrication Techniques for Cultural Heritage: A Survey]" (PDF). Computer Graphics Forum. 36 (1): 6–21. doi:10.1111/cgf.12781. ^ "Museum uses 3D printing to take fragile maquette by Thomas Hart Benton on tour through the States". Archived from the original on 17 November 2015. ^ "British Museum releases 3D printer scans of artefacts". 4 November 2014. ^ "Threeding Uses Artec 3D Scanning Technology to Catalog 3D Models for Bulgaria's National Museum of Military History". 3dprint.com. 20 February 2015. ^ Zolfagharian, Ali; Kouzani, Abbas Z.; Khoo, Sui Yang; Moghadam, Amir Ali Amiri; Gibson, Ian; Kaynak, Akif (2016). "Evolution of 3D printed soft actuators". Sensors and Actuators A: Physical. 250: 258–272. doi:10.1016/j.sna.2016.09.028. ^ "3D Printing Technology Insight Report, 2014, patent activity involving 3D-Printing from 1990–2013" (PDF). Retrieved 10 June 2014. ^ Thompson, Clive (30 May 2012). "3-D Printing's Legal Morass". ^ a b Weinberg, Michael (January 2013). "What's the Deal with copyright and 3D printing?" (PDF). Institute for Emerging Innovation. Retrieved 30 October 2013. ^ "Homeland Security bulletin warns 3D-printed guns may be 'impossible' to stop". Fox News. 23 May 2013. Retrieved 30 October 2013. ^ "Controlled by Guns". Quiet Babylon. 7 May 2013. Retrieved 30 October 2013. ^ "3dprinting". Joncamfield.com. Retrieved 30 October 2013. ^ "State Dept Censors 3D Gun Plans, Citing 'National Security'". News.antiwar.com. 10 May 2013. Retrieved 30 October 2013. ^ "Wishful Thinking Is Control Freaks' Last Defense Against 3D-Printed Guns". Reason.com. 8 May 2013. Retrieved 30 October 2013. ^ Lennard, Natasha (10 May 2013). "The Pirate Bay steps in to distribute 3-D gun designs". Salon.com. Archived from the original on 19 May 2013. Retrieved 30 October 2013. ^ "US demands removal of 3D printed gun blueprints". neurope.eu. Retrieved 30 October 2013. ^ "España y EE.UU. lideran las descargas de los planos de la pistola de impresión casera". ElPais.com. 9 May 2013. Retrieved 30 October 2013. ^ "Sen. Leland Yee Proposes Regulating Guns From 3-D Printers". CBS Sacramento. 8 May 2013. Retrieved 30 October 2013. ^ "Schumer Announces Support For Measure To Make 3D Printed Guns Illegal". ^ "Four Horsemen of the 3D Printing Apocalypse". Makezine.com. 30 June 2011. Archived from the original on 30 March 2013. Retrieved 30 October 2013. ^ Ball, James (10 May 2013). "US government attempts to stifle 3D-printer gun designs will ultimately fail". The Guardian. London. ^ Gadgets (18 January 2013). "Like It Or Not, 3D Printing Will Probably Be Legislated". TechCrunch. Retrieved 30 October 2013. ^ Klimas, Liz (19 February 2013). "Engineer: Don't Regulate 3D Printed Guns, Regulate Explosive Gun Powder Instead". The Blaze. Retrieved 30 October 2013. ^ Beckhusen, Robert (15 February 2013). "3-D Printing Pioneer Wants Government to Restrict Gunpowder, Not Printable Guns". Wired. Retrieved 30 October 2013. ^ Bump, Philip (10 May 2013). "How Defense Distributed Already Upended the World". The Atlantic Wire. Archived from the original on 19 May 2013. Retrieved 30 October 2013. ^ "News". European Plastics News. Retrieved 30 October 2013. ^ Cochrane, Peter (21 May 2013). "Peter Cochrane's Blog: Beyond 3D Printed Guns". TechRepublic. Retrieved 30 October 2013. ^ Gilani, Nadia (6 May 2013). "Gun factory fears as 3D blueprints put online by Defense Distributed". Metro.co.uk. Retrieved 30 October 2013. ^ "Liberator: First 3D-printed gun sparks gun control controversy". Digitaljournal.com. Retrieved 30 October 2013. ^ "First 3D Printed Gun 'The Liberator' Successfully Fired". International Business Times UK. 7 May 2013. Archived from the original on 29 October 2013. Retrieved 30 October 2013. ^ EU-OSHA, European Agency for Safety and Health (7 June 2017). "3D Printing and monitoring of workers: a new industrial revolution?". osha.europa.eu. Retrieved 31 October 2017. ^ Fuges, Christina M. "Changing the Rules". www.additivemanufacturing.media. Retrieved 30 October 2017. ^ a b c d e f "Control Measures Critical for 3D Printers". NIOSH Research Rounds. U.S. National Institute for Occupational Safety and Health. June 2016. Retrieved 3 July 2017. ^ Azimi, Parham; Zhao, Dan; Pouzet, Claire; Crain, Neil E.; Stephens, Brent (2 February 2016). "Emissions of Ultrafine Particles and Volatile Organic Compounds from Commercially Available Desktop Three-Dimensional Printers with Multiple Filaments". Environmental Science & Technology. 50 (3): 1260–1268. Bibcode:2016EnST...50.1260A. doi:10.1021/acs.est.5b04983. ISSN 0013-936X. PMID 26741485. ^ Stefaniak, Aleksandr B.; LeBouf, Ryan F.; Yi, Jinghai; Ham, Jason; Nurkewicz, Timothy; Schwegler-Berry, Diane E.; Chen, Bean T.; Wells, J. Raymond; Duling, Matthew G. (3 July 2017). "Characterization of chemical contaminants generated by a desktop fused deposition modeling 3-dimensional Printer". Journal of Occupational and Environmental Hygiene. 14 (7): 540–550. doi:10.1080/15459624.2017.1302589. ISSN 1545-9624. PMC 5967408. PMID 28440728. ^ "Is 3D Printing Safe". American Industrial Hygiene Association. 3 May 2017. Retrieved 29 July 2017. ^ "Current Intelligence Bulletin 65: Occupational Exposure to Carbon Nanotubes and Nanofibers". U.S. National Institute for Occupational Safety and Health. 2013. Retrieved 20 June 2017. ^ Pelley, Janet (26 March 2018). "3-D printer emissions raise concerns and prompt controls". Chemical & Engineering News. 96 (13). ISSN 1520-605X. OCLC 244304576. Retrieved 18 October 2018. ^ "After explosion, US Department of Labor's OSHA cites 3-D printing firm for exposing workers to combustible metal powder, electrical hazards". U.S. Occupational Safety and Health Administration. 20 May 2014. Archived from the original on 3 August 2017. Retrieved 3 July 2017. ^ a b "3D Printing Safety" (PDF). Carnegie Mellon University Environmental Health & Safety. ^ "Ultimate Guide to Finishing 3D Printed Parts | Fictiv – Hardware Guide". www.fictiv.com. Retrieved 19 October 2017. ^ Dahm, Matthew M.; Evans, Douglas E.; Schubauer-Berigan, Mary K.; Birch, Eileen M.; Fernback, Joseph E. (1 July 2012). "Occupational Exposure Assessment in Carbon Nanotube and Nanofiber Primary and Secondary Manufacturers". The Annals of Occupational Hygiene. 56 (5): 542–56. doi:10.1093/annhyg/mer110. ISSN 0003-4878. PMC 4522689. PMID 22156567. ^ Matthews, Richard. "Proposed new regulations for 3D printed medical devices must go further". The Conversation. Retrieved 3 October 2018. ^ "Jeremy Rifkin and The Third Industrial Revolution Home Page". The third industrial revolution.com. Retrieved 4 January 2016. ^ "A third industrial revolution". The Economist. 21 April 2012. Retrieved 4 January 2016. ^ "Confronting a New 'Era of Duplication'? 3D Printing, Replicating Technology and the Search for Authenticity in George O. Smith's Venus Equilateral Series". Durham University. Retrieved 21 July 2013. ^ "Materializing information: 3D printing and social change". Retrieved 13 January 2014. ^ "Additive Manufacturing: A supply chain wide response to economic uncertainty and environmental sustainability" (PDF). Archived from the original (PDF) on 15 January 2014. Retrieved 11 January 2014. ^ "Materializing information: 3D printing and social change". Retrieved 30 March 2014. ^ "RepRap Options". Retrieved 30 March 2014. ^ "3D Printing". Retrieved 30 March 2014. ^ "Thingiverse". Retrieved 30 March 2014. ^ a b c d Kostakis, V. (2013): At the Turning Point of the Current Techno-Economic Paradigm: Commons-Based Peer Production, Desktop Manufacturing and the Role of Civil Society in the Perezian Framework.. In: TripleC, 11(1), 173–190. ^ Kostakis, Vasilis; Papachristou, Marios (2014). "Commons-based peer production and digital fabrication: The case of a Rep Rap-based, Lego-built 3D printing-milling machine". Telematics and Informatics. 31 (3): 434–43. doi:10.1016/j.tele.2013.09.006. ^ Kostakis, Vasilis; Fountouklis, Michail; Drechsler, Wolfgang (2013). "Peer Production and Desktop Manufacturing". Science, Technology, & Human Values. 38 (6): 773–800. doi:10.1177/0162243913493676. JSTOR 43671156. ^ Andre, Helene (29 November 2017). "Naomi Wu – "My visibility allows me to direct more attention to important issues and other deserving women"". Women in 3D Printing. Retrieved 3 December 2017. ^ Hardcastle, Jessica Lyons (24 November 2015). "Is 3D Printing the Future of Sustainable Manufacturing?". Environmental Leader. Retrieved 21 January 2019. ^ Simpson, Timothy W. (31 January 2018). "Lightweighting with Lattices". Additive Manufacturing. Retrieved 21 January 2019. ^ Reeves, P. (2012). "Example of Econolyst Research-Understanding the Benefits of AM on CO2" (PDF). The Econolyst. Retrieved 21 January 2019. ^ Gelber, Malte; Uiterkamp, Anton J.M. Schoot; Visser, Cindy (October 2015). "A Global Sustainability Perspective of 3D Printing Technologies". Energy Policy. 74 (1): 158–167. doi:10.1016/j.enpol.2014.08.033. ^ Peng, Tao; Kellens, Karel; Tang, Renzhong; Chen, Chao; Chen, Gang (May 2018). "Sustainability of additive manufacturing: An overview on its energy demand and environmental impact". Additive Manufacturing. 21 (1): 694–704. doi:10.1016/j.addma.2018.04.022. Tran, Jasper (2017). "Reconstructionism, IP and 3D Printing". Available on SSRN. SSRN 2842345. Tran, Jasper (2016). "Press Clause and 3D Printing". Northwestern Journal of Technology and Intellectual Property. 14: 75–80. SSRN 2614606. Tran, Jasper (2016). "3D-Printed Food". Minnesota Journal of Law, Science and Technology. 17: 855–80. SSRN 2710071. Tran, Jasper (2015). "To Bioprint or Not to Bioprint". North Carolina Journal of Law and Technology. 17: 123–78. SSRN 2562952. Tran, Jasper (2015). "Patenting Bioprinting". Harvard Journal of Law and Technology Digest. SSRN 2603693. Lindenfeld, Eric; et al. (2015). "Strict Liability and 3D-Printed Medical Devices". Yale Journal of Law and Technology. SSRN 2697245. Dickel, Sascha; Schrape, Jan-Felix (2016). "Materializing Digital Futures". The Decentralized and Networked Future of Value Creation. Progress in IS. pp. 163–78. doi:10.1007/978-3-319-31686-4_9. ISBN 978-3-319-31684-0. "Results of Make Magazine's 2015 3D Printer Shootout". Retrieved 1 June 2015. Vincent; Earls, Alan R. (February 2011). "Origins: A 3D Vision Spawns Stratasys, Inc". Today's Machining World. 7 (1): 24–25. Archived from the original on 10 March 2012. Albert, Mark (17 January 2011). "Subtractive plus additive equals more than ( – + + = > )". Modern Machine Shop. 83 (9): 14. Stephens, B.; Azimi, P.; El Orch, Z.; Ramos, T. (2013). "Ultrafine particle emissions from desktop 3D printers". Atmospheric Environment. 79: 334–339. Bibcode:2013AtmEn..79..334S. doi:10.1016/j.atmosenv.2013.06.050. "3D printing: a new industrial revolution – Safety and health at work – EU-OSHA". osha.europa.eu. Retrieved 2017-07-28. Hod., Lipson (11 February 2013). Fabricated : the new world of 3D printing. Kurman, Melba. Indianapolis, Indiana. ISBN 9781118350638. OCLC 806199735.